Home > Law Books > Federal/National Materials > Construction Schedule Delays, 2018 ed. Construction Schedule Delays, 2018 ed. Construction Schedule Delays bridges many divides in construction disputes, affecting proof of liability and damages, and requiring both legal and technical acumen to apply correctly and consistently. As a result, the field represents one of the more complicated subsets of construction law. 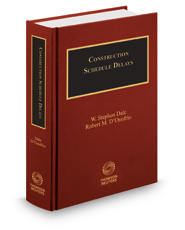 Coauthored by a construction lawyer and an engineer, Construction Schedule Delays deftly connects both the legal and technical aspects of the topic from an easy-to-understand, but detailed presentation of law and examples. In addition to addressing the major delay analysis methods in use today, the book reviews legal aspects of other critical topics, such as basics of CPM scheduling, concurrent delay, and constructive acceleration. With more than 1,000 pages, this work also comprises one of the most comprehensive treatises on the subject. The text includes a comparison of 14 different schedule delay analysis methods, all applied to the same fact pattern, analyzing their strengths and weaknesses. The text also identifies more than 214 case references to specific schedule delay analysis methods, summarizing the legal acceptance of each method, a review of industry guidance on the subject, and recommended guidelines for schedule delay analysis. The text also includes a comprehensive review of more than 202 disruption cases spanning six chapters, and covering court and board acceptability of methods for proving disruption.